Mom's Gone Bronson! : Freeman Bare Foot Foot Scrub Saves My Day! I received a coupon, via Influenster, for a FREE Freeman Bare Foot product and finally managed to track some down at Walmart this week - they have been selling out like hot cakes and so they must be popular! 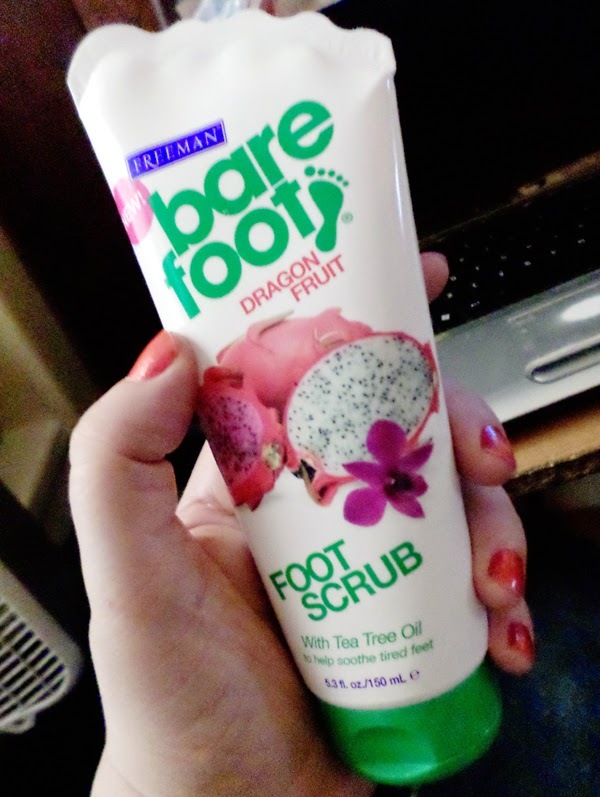 I picked up the Bare Foot Foot Scrub with Tea Tree Oil, in a Dragon Fruit scent - something, which anybody who knows me will know made my day as I LOVE Dragon Fruit to the nth degree! With the summer heat, long days and all the back and forth on the feet all day long it is always nice to treat your feet to a little extra time, love and affection as they are often one of the things we forget about and one of the most used! Why not get yourself a nice hot bucket of water and give your feet a good soak and scrub with this, while watching your favorite movie or even while sitting outside in the nice, warm sunshine!? It really only takes a few minutes to scrub and rinse but honestly, your feet will thank you for it, just as mine did after walking for hours yesterday and being on my feet the whole day with one thing or another without much of a break in-between - feet soaked and scrubbed and boom! If feet could send thank you notes and flowers I am pretty sure these tootsies would have sent some with bells on! Why not track some down at a store near you and check out the rest of the Bare Foot line? You never know what you might find! DisClaimer: All views are my own and yours may differ, thank you!